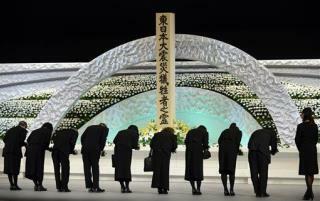 (Newser) – Japan is marking the third anniversary of a devastating earthquake and tsunami that left nearly 19,000 people dead or missing, turned coastal communities into wasteland, and triggered a nuclear crisis. In Tokyo, Prime Minister Shinzo Abe and Emperor Akihito spoke at a memorial service, marking the moment the magnitude 9.0 earthquake struck. Clean up? The reactor meltdown is not yet contained.